My mum passed away just after midnight yesterday morning. It’s now 4am Friday morning, and I’ve been awake since 2am. Mind you, I was in bed at 8pm yesterday evening, so sleep has been had and that’s good! So I’m sat here thinking; what is this really all about? Well, for many in this world, the view will be death is the end, after that, nothing. That’s one view you can have I guess. It’s not exactly a very positive one though is it. To the follower of Jesus, whether someone who is facing death themselves, or an onlooker in the process, death actually means Life. We don’t fear it. That’s why my boys have shared in the death of their Grandma. I haven’t kept them away from it, or tried to protect them from it. And we have talked together, not out of fear, but out of love and hope, and about the fact that it’s all about Life. I was talking to someone last Monday about how we teach our children out of fear or out of love. The end results are completely different. That’s perhaps another post subject! Now how death comes is sometimes gruesome and unpleasant. It doesn’t make sense, it’s hurtful to those looking on who love the person concerned. In that respect, followers of Jesus share in the sufferings of Christ. Here was a man who suffered the most gruesome and painful means of death the world could throw at him. To those onlookers who loved him, it didn’t make sense and was painful for them. But he always knew what was coming after. He had faith in his Father. And the world might throw pain, suffering, disease or any such means at a follower of Jesus. Facing death ourselves or as an onlooker, we face what Christ did. How that comes is different for all, it’s still the same point we come to. But if we share in his sufferings, we also share in his hope. We have a new hope. Life! After he had risen, Jesus said these words to Mary. Why? Well, he hadn’t yet gone to where he was supposed to be. But he knew that going where he was supposed to be meant not just fulfilling the hope he had, but bringing that hope to all. The hope of new Life in himself, and the hope of sharing that Life with others. So, to an onlooker who is a follower of Jesus, we see that we have shared in the death of Christ and in the death of another person. And so we also share in the new hope of Life that Christ stepped into and that the person has stepped into. If we stop at the death, our view is no more than the negative view that many might have. 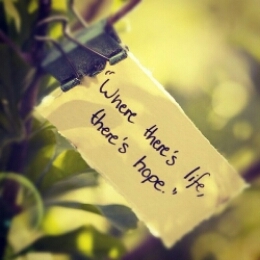 But the hope doesn’t stop there. This hope brings new Life to us too! And this Life is what we receive in Jesus Himself. Now some of you who read these posts might wonder why I’m always banging on about the True Bread of Heaven. It’s because that’s exactly how this new hope continues within us, and how this new hope is shared with others. It’s because at times like this you find out what you have within you. A vacant, dormant space, or a living, active, pulsating, vibrant Life that sustains you and others! The last year for me has been like that. I can honestly say that I have never had a year like it. The number of situations that have arisen, whether personally or as an onlooker, have been unprecedented in this timeframe compared to my lifetime so far. And they continue on too, none of them have reached any sort of conclusion yet. And that’s why I’m always banging on about the Bread of Life! When I saw Jesus as the Bread of Life in January of last year, I could not have foreseen how essential that revelation (which led me to living in the experience) would become to me. I know that I would have given up without that. It’s because we receive spiritual food, the True Bread of Heaven, Jesus Himself who sustains us and becomes Life in us, and in turn gives Life to others. I can’t cling to Mum, she has received her hope. She encouraged us all to continue to receive this new hope from Jesus Himself. Hope that means the step from life to Life is just that, a step forward into new Life in Jesus being shared with others. Eat the Bread, drink the Living Water. Receive this new hope, and share this hope with others. Excellent thoughts. The great American Evangelist, DL Moody wrote to a member of his congregation…”one of these days you will read in the paper, MOODY IS DEAD…Don’t you believe it. On that day I will be more alive that I’ve ever been”. I seem to conduct too may funerals these days, but I’m always in awe of God…that is when the powerful work of JESUS CHRIST becomes a reality: a destiny changed Eternal life with the LORD.